The soul singer was 60. We are deeply saddened to announce Sharon Jones passed away today after a heroic battle against pancreatic cancer. She was surrounded by her loved ones, including the Dap-Kings. Thank you for your prayers and thoughts during this difficult time. In lieu of flowers, donations may be made to the following organizations: The Lustgarten Foundation, James Brown Family Foundation and Little Kids Rock. More details are available on Sharon’s website (see link in bio). Additional memorial details will follow soon. 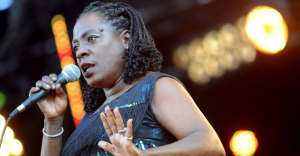 Sharon Jones, frontwoman for the classic soul revival outfit Sharon Jones and the Dap-Kings, has passed away at 60. The singer was diagnosed with pancreatic cancer in 2013, and finally lost an extended battle with the disease today. "She was surrounded by her loved ones, including the Dap-Kings," a press release said. Jones and the Dap-Kings were the first act to release an album on Daptone Records, the Brooklyn-based funk and soul label that helped revive the careers of Lee Fields and Charles Bradley, and inspired Amy Winehouse's Back to Black. Jones, whose music industry success came mostly over the last two decades of her life, was known for her raspy, powerhouse vocal performances. Sharon and the Dap-Kings recorded five studio albums for Daptone, including the Grammy-nominated Give the People What They Want, released in 2014. Jones' later life, music, and first battle with cancer, were documented in the 2015 documentary Miss Sharon Jones! "In lieu of flowers" her family is asking fans to donate to charities related to music education (The James Brown Family Foundation and Little Kids Rock) and combatting pancreatic cancer (The Lustgarten Foundation).